The Christian religious system has a long-standing tradition of excluding and vilifying other people. Much of the teaching I received while a Christian really boiled down to who I was supposed to hate and why, and how I could not be one of those people. Before examining this in more detail I really need to talk about the spiritual predecessors of Christianity: the Pharisees. The Pharisees were a Jewish sect whose members were criticized time and time again by Jesus. Because of this, the Pharisees have historically been a convenient way for Christians to dismiss their opponents without actually dealing with their opponents position. If you label your enemies as “Pharisees” you invoke the condemnation of Jesus Christ Himself, which is a powerful weapon indeed. This tactic has a rich tradition within Christianity and it works irregardless of it is actually fair to connect your enemies with the Pharisees. This tactic has most often gone hand in hand with an understanding that the Pharisees believed one could earn your personal salvation through works of the Law, as opposed to the true Gospel Jesus brought that salvation comes through faith in Him. This is a mostly a Protestant myth. While the Pharisees were indeed concerned with laws, both the Mosaic Laws and their own laws and traditions, their concern for laws was not what it is often made out to be. So what exactly was their error and why did Jesus rebuke them? To answer this question I am going to examine their beliefs and history in more detail. The Pharisees were one of many Jewish sects that arose in the intertestamental period, that is the time between the Prophets and the Gospels. The Pharisees, the Sadducees, and the Essenes are probably the most well-known Jewish sects from this time. Much like contemporary Christian denominations, each of these sects had different interpretations of the scripture. One of the main points of contentions between them was who would inherit the promises made to Abraham, the promised coming Messiah, the promised restoration of Israel and under what criteria this was to be determined. Each thought they had the truth and were to be the Remnant of Israel that the promised Messiah would come and save. These groups were not fighting over how one achieves personal salvation and goes to Heaven instead of Hell, their concern was the restoration of Israel, what that would look like, and who was to receive it. More to the Pharisees in particular, the name Pharisee literally means “the set apart ones.” As their name would imply their primary concern was maintaining the traditional boundary markers of Israel to set themselves apart from the pagans around them and from Hellenized Jews (Jews who were increasingly Roman and Greek in their thinking and behavior). The practices of circumcision, temple worship and sacrifices and observance of the Law all served as boundary markers that helped mark who was, and who was not, a Jew. The Pharisees rigorously observed and obsessed over these external markers in order to maintain the Jewish identity and be the promised Remnant of Israel. It was from this concern for keeping the Mosaic Law that the Pharisees developed laws and traditions above and beyond the Laws given by God. The rationale was that if you did not break the laws and traditions of the Pharisees you could rest assured that you had not broken the Laws of God. Other times they simply wanted a clear-cut understanding of what keeping and breaking the Law of God would look like when this was left ambiguous by the Mosaic Law. For example, God commanded that His followers not work on the Sabbath. But what exactly counted as working on the Sabbath? The Pharisees clarified this ambiguity by making many rules defining what counted as work and what did not. The concern for maintaining these cultural boundary markers is understandable given some of the history that many Protestants are unaware of because they cut out 1st and 2nd Maccabees out of their Bible. In the 2nd century BC Antiochus IV Epiphanes, a Seleucid Emperor, had sided with Hellenized Jews in a civil war with more traditional Jews. Epiphanes wanted to Hellenize every Jew, to force them to assimilate into the culture of his empire, in order to make his own nation easier to rule and to guard against any future insurrections. To this end he brutally enforced a ban on the distinct customs and laws of the people of Israel in an effort to erase their identity. He would have babies who were found to be circumcised hung from the necks of their mothers for all to see and ransacked Jerusalem and looted the Temple. The Maccabean revolt was a backlash against this and the concept of Judaism was birthed during this time. Judaism began as a desire to maintain the Jewish identity and history, especially through maintaining the distinct customs and laws of the Israelite people, in reaction to this attempt at forced assimilation. 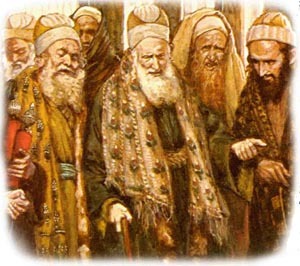 The Pharisees were heirs of this time period and one can better understand their concern with maintaining the Jewish identity and their hope of a freed and restored Israel that would return to political and military might in light of this history of persecution and attempts to forcibly remove the marks of their culture. In short: the Pharisees’ concern for the Law and circumcision was driven by an understandable desire to maintain the cultural identity and history of the people of God in the face of overwhelming and brutal efforts to erase that identity, culture and history. Obedience and observance of the laws marked who was “in” Israel and who was not. If you were not circumcised you were clearly not a Jew and were seen as a Gentile threat either to the pure worship of the LORD or to the actual physical safety of Jewish people who had seen their share of violent invasions. In addition to this their traditions and laws were designed to keep people from breaking God’s laws in a desire to be the inheritors of the promises of Israel. The error of the Pharisees then had nothing to do with earning personal salvation (as Christians envision it) through works of the Law. Their practices and beliefs appear to be at least well-intentioned and reasonable given their circumstances. So beyond being hypocritical and not obeying their own man-made laws that they enforced on other people, where did the Pharisees go so wrong? First, as Wright highlights here, they had become so obsessed with protecting Israel and the hope of a political Messiah that they forgot that the Abrahamic covenant was not for political dominance but to be a blessing to all nations. (Gen 12, Gen 22) They had become too fearful and hateful of Gentiles, they had become to xenophobic, to be the blessing to Gentiles that they were supposed to be blessing to. This was in part due to the fact that their hope for the future was not in line with what God had planned. God did not restore the Twelve Tribes of Israel into political and military superpower that obliterated the Roman occupation of the Holy Land. God sent Jesus Christ, reconciled all people to Himself and placed His Spirit inside His followers. God even reconciled Gentiles that did not fit either the historical boundary markers of Israel or the man-made rules of Pharisees. God even reconciled to Himself people who lived within the Roman Empire power structure, an Empire that had oppressed the Jews and would later destroy the Temple. (Acts 10) Some Jews were able to accept this and some did not. Even some Pharisees came to accept this, but one can still see their penchant for rule keeping and their concern for the historic boundary markers of Israel. Now looking forward to my next post I have suggested the Pharisees are the spiritual predecessors of Christians. Is this an unfair assessment of Christianity? Am I making an unfounded connection between the Pharisees and Christianity to invoke the condemnation of Jesus Christ as I’ve already mentioned is often done in Christian circles? I think not. Before explaining why I believe this connection is justified in a later post I shall first introduce the concept of a Bounded Set in my next post, and how it applies to this topic. This entry was posted in Faith, Personal Commentary, Why do we believe... and tagged Christianity, exclusion, homophobia, Jesus, Jesus Christ, Jewish Sects, legalism, Pharisees, religion, the Bible, the error of the Pharisees, the Mosaic Law, vilification, works righteousness, xenophobia. Bookmark the permalink.